Kapil revealed that he wanted bribe of Rs. 20,000 and Chandu agreed. He gave Kapil the money and Nani saw that. She asked Chandu if he had money then why he didn’t give back the money he owed her. Kapil was counting the money and planned to give the money to Nani, so Chandu caught his legs. But Ash shot back and said that they had worked together in Guru, where they were aging too. She even revealed that just after the movie, Abhishek had proposed and so he knew about his future already. What followed was hilarious! Khajoor called Ash his mother, Amitabh his Dada and himself the heir of Bachchan family. Ash kept falling on the Sofa with laughter. 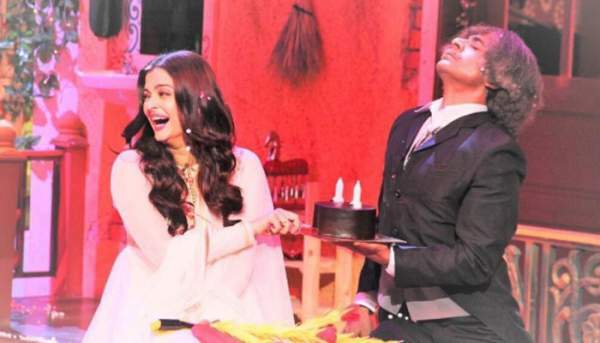 Kapil poked fun at ASH calling her a big celebrity. However, Ash proved that she was also a regular person when she said that she also counted the number of clothes she gave for laundry and scored it when it came back too. She also revealed that she was the first one to say sorry when she had a lover’s tiff with her hubby. Kapil then called on stage Randeep Hooda. The comedian said that Randeep had lost a lot of weight, to which the actor replied that last time he came on his show, he had not taken proper care of him last time he had come on Kapil’s show. So post that he has a lot of weight loss. However, he also took an indirect dig at Colours when he said that the show was same to same but different, a little better than the first one. Sunil Grover came in as Doctor Mashoor, and his act was fabulous as always. He did a lot of os masti with the stars and even made Randeep act as if he had come to meet doctor’s daughter Sarla for marriage. The doctor was shocked and his ‘Apne’ ranted with different expressions went on until the end of the show, making everyone fall laughing. Ash was in disbelief as the doctor performed a romantic dance with her. Another highlight of the show was the footage of The Kapil Sharma Show’s team visit to the Wagah Border. It was really heart touching, and everyone would want to go to that favorite spot ASAP after seeing the clip!